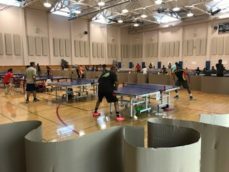 The Spring Break Ping-Pong Camp is for kids who want to learn while having fun. It is open to all levels with basic skills taught to beginners with no prior experience and more advanced skills taught to more advanced students. Each session involves forehand and backhand counters and individualized training. FTTA keeps a maximum of 3 kids per table with a coach on every table. For maximum fun, each class ends with fun games to determine class champions!